Some of the 25 cooks who prepared dishes for the guests. Saturday evening, May 18, the Post 30 held a “Tasting Fundraiser” providing over 25 different dishes from over 25 different cooks. The doors opened at 7:00 p.m. and the eager diners were hosted to a sit-down dinner served on platter sized plates. 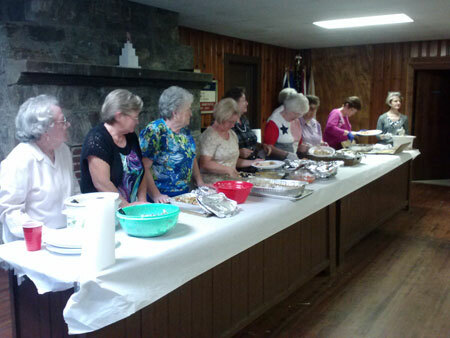 The Women’s Auxiliary lined up to serve a “taste” of every dish. 90 plus “Southern Gourmets” sampled the fixin’s and shouted their approval. Post Commander Jo Jo Doolittle said that proceeds from the sales of tickets will go to upkeep of the post.